There are many collections of letters and Civil War memoirs available today, but very few offer in-depth information about the medical treatment of wounded soldiers. In Repairing the "March of Mars": The Civil War Diaries of John Samuel Apperson, Hospital Steward in the Stonewall Brigade, 1861-1865, editor John Herbert Roper provides an important supplement to this understudied aspect of the Civil War. John Samuel Apperson was born in 1837 to a family of small freeholders who owned no slaves. Thus, when the war broke out in 1861, Apperson’s choice to fight for the Confederacy reflected his loyalty to Virginia rather than his desire to protect and defend the slave system. Apperson enlisted in Company D of the First Virginia Brigade, and was initially assigned to the marching regiment. However, when it was discovered that in the two years prior to the war he had studied and apprenticed to a physician, Apperson was transferred to the field hospital unit. His experiences there form the substance of the diary here published for the first time. 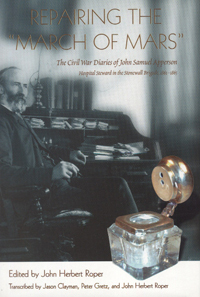 Apperson’s diary is a sensitive and painstaking observation of the details of medical treatment during and after battle. For all periods of the war, his detailed personal records supplement and correct official army hospital records, and for certain periods, his diary provides the only medical information available. For example, Apperson was present at the amputation of Stonewall Jackson’s arm, and his diary shows that Jackson died of postoperative pneumonia, and not of a botched surgery. This book is essential reading for anyone interested in the American Civil War and in the history of medicine.